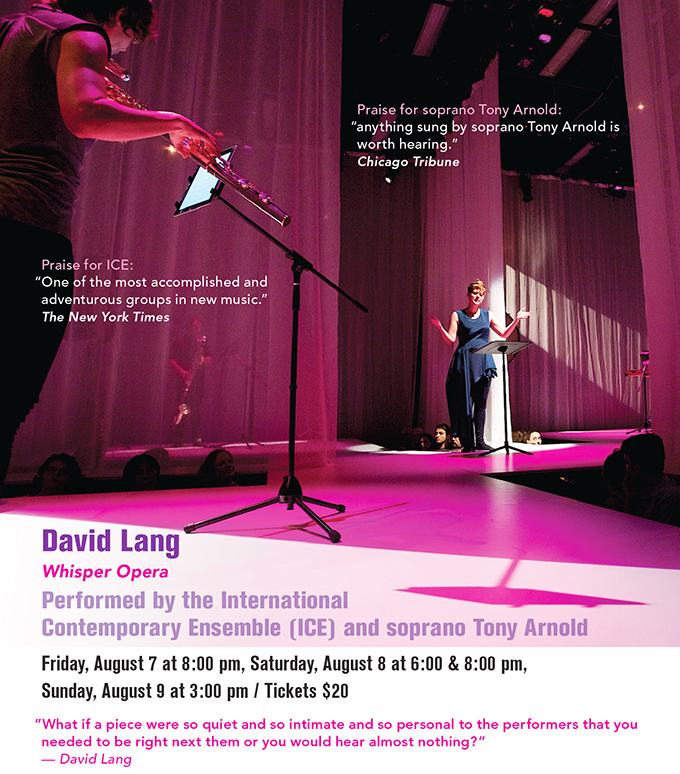 The International Contemporary Ensemble (ICE) returns for its fifth consecutive season with a quietly powerful, intimate, operatic work by Pulitzer Prize-winning composer David Lang. Written at Mount Tremper Arts and directed and designed by Jim Findlay, Whisper Opera mesmerizes with delicate and fragile performances of nearly inaudible sounds. Breathing phrases drawn from web searches on fragments such as “when I am alone I always,” soprano Tony Arnold confides secrets and sighs, embracing listeners with the susurrations of hidden lives. David Lang received the Pulitzer Prize for the little match girl passion in 2008. Musical America's 2013 Composer of the Year, Lang is one of America's most performed composers and co-founder of New York's legendary music festival, Bang on a Can. With 35 leading instrumentalists performing in forces ranging from solos to large ensembles, the International Contemporary Ensemble (ICE) is dedicated to reshaping the way music is created and experienced. Each Whisper Opera performance is limited to 35 seats; advanced tickets are highly recommended. David Lang’s Whisper Opera was commissioned through Meet the Composer’s Commissioning Music/USA program, which was made possible by generous support from the Mary Flagler Cary Charitable Trust, the Ford Foundation, the Francis Goelet Charitable Lead Trusts, New York City Department of Cultural Affairs, New York State Council on the Arts, the William and Flora Hewlett Foundation, and the Helen F. Whitaker Fund.